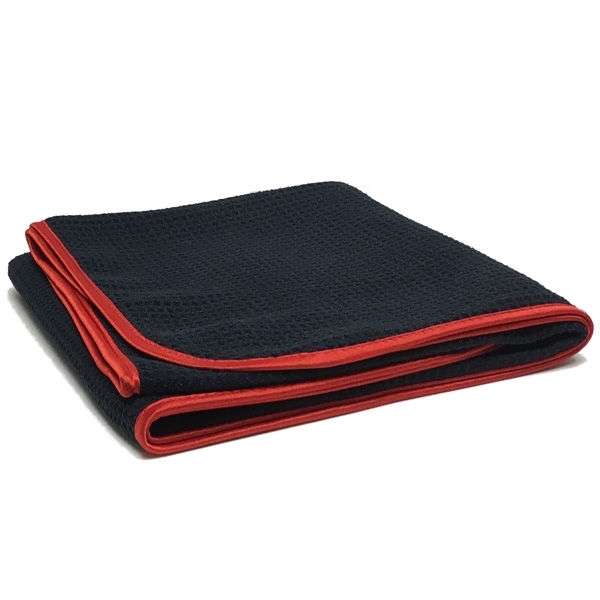 Waffle Weave 400 Microfiber Drying Towel - Black w/ Red Silk Edges - 25" x 36"
These heavy weight microfiber waffle weave towels feature deep waffle pockets to whisk away and trap water from any surface. These microfiber drying towels for cars are a favorite of automotive enthusiasts who are looking to pamper their ride. The silk edge banding of this microfiber car drying towel is ultra soft and gentle. The large size of these waffle weave towels for cars means you only need one to dry off even the largest vehicle. Dual-Pile 360 Microfiber Drying Towel - Light Blue w/ Blue Silk Edges - 25" x 36"
Waffle Weave 460 Microfiber Drying Towel - Blue w/ Black Silk Edge - 25" x 36"